How Do Airbrush Kits Work? Which Airbrush Kit Features Make a Product Better Than Another? An airbrush makeup kit takes your primping to the next level. They are faster than applying liquid foundation. The airbrush puts you in control so that you can get the look you want and cover up the little things that annoy you. And using an air brush makeup system is easier than you think. You’ll soon find yourself wondering what took you so long to give it a go! Kits contain the basics that include an air compressor and airbrush. These are your tools for creating flawless coverage. The results are amazing if the airbrush makeup reviews are any sign. Here are six choices for our picks for the best airbrush makeup kit. The Air of Air Professional Airbrush Cosmetic Makeup System is a complete kit. It creates flawless skin from anti-aging moisturizing primer base to tropical bronzer finish. The best way to describe this makeup system is versatile. It has six foundation shades and three finishing options. You’ll have a broad palette of makeup choices. The makeup system works quickly to cover blemishes and signs of aging. You decide the level of coverage you want for a natural finish that doesn’t look phony. The kit includes an anti-aging moisturizer primer for keeping your skin healthy and looking its best. And its super quiet compressor makes it easy to apply your makeup discreetly and quickly. The Temptu Pro Kit is an excellent choice for the beginner who wants to get started. The system includes a broad range of foundation shades for mixing and creating the perfect finish. The SP-40 airbrush provides beautiful, natural coverage that lasts all day long. The system includes the air compressor, airbrush, a 12-pack starter set, and a cleaning kit with cleaner. It is easy to operate and clean for long-lasting performance. Though it cost more, the equipment is professional quality. It works with silicone-based foundations that are a healthier choice for your skin. 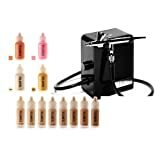 The Foundation Deluxe Dinair Kit has everything you need and more to get that glam look you want. The airbrush comes in compact size that is easy to control and manage. The makeup system goes out of its way to make it simple for the beginner. It has complimentary makeup lessons and even guides on the gun to help you get the application right. The kit includes a lot of extras besides the basics. It has four shades and five bonus colors for blush and shade/brow. You’ll also get concealer, facial tanner, and its signature Moist & Dewy Moisturizer. It’s an excellent choice for the beginner or experienced user alike. The Tickled Pink Airbrush Kit is a well-designed product. It is backed up by a 2-year manufacturer’s warranty and a lifetime warranty on the airbrush. The company succeeds not only with a quality product. It delivers superior customer service judging by the airbrush makeup reviews. Its website is an excellent resource for women learning how to airbrush. The kit includes the basics along with three shades of its water-based makeup foundation. They contain organic ingredients. It stands out with those extras that make a difference when you use it. It has a long air hose with an airbrush holder. The motor on the compressor is quiet and easy to use. 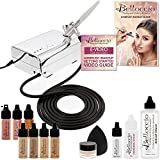 The Belloccio Professional Beauty Airbrush Cosmetic Makeup System is a complete product. It includes everything you need to get started fast with airbrushing. It is an excellent value for the price considering all that you get with it. We liked the customized medium shade kit that includes its water-based foundations for natural, lightweight coverage. The kit includes the basics with four makeup shades. It also has primer, finishing products, and other goodies like the Belloccio finishing spray and a DVD tutorial. The extras are a nice touch that makes the product a better value. It includes a carrying case, so you can take it wherever you travel. The Aeroblend Personal Starter Kit combines the features of the best products with its unique spin. Application is simple with its easy-to-control sprayer with its water-based foundations. They are a nice blend of botanicals and essential oils that are safe even for sensitive skin. The kit delivers great coverage that easily covers imperfections. The kit includes the basics with five foundation shades, two blush shades, highlighter, and bronzer. We liked the fact that the seller will go out of their way to match shades for customers with free samples. The buyer reviews boast of how easy this kit is to use. That’s a strong selling point for someone hesitant to take the plunge. If you’ve never tried airbrushing, you’re bound to have questions. It’s essential to understand that it takes a few tries to get it right. It is, after all, something new. You’ll likely find that the coverage is better than liquid foundations. It’ll look more natural and feel less cakey on your skin. Many women find that they prefer it to the old stuff and won’t ever go back. The greatest perk of using an air brush is that you can get flawless coverage in a fraction of the time. It is lightweight too. You’ll notice a difference right away. You also can customize your look for the occasion. Want a natural look? You’ve got it! Want to go all out for a special night out? You can do that too. Most kits contain everything you need to get started. Most are designed with the user in mind. They work quietly so that no one can guess your secret for amazing looking skin. You can also customize your look with added finishing products like bronzers and blushes. You can use it to cover flaws in your skin like blemish or fine lines. You’ll likely find that your face looks younger too. You’ll find airbrush kits that use either water-based or silicone-based foundations. The advantage with the latter is that it’s a healthier option for your skin. You use a small amount of foundation. We’re talking drops. The airbrush delivers it as a mist on your face. The makeup is lightweight and will last all day long. Cleaning the airbrush is an essential part of using one. If you don’t clean it every time you use it, it can get clogged. That will make the spray uneven and mess up your coverage. Look for an airbrush kit that includes a cleaner and tools to keep the airbrush working properly. That may add a bit of time to your makeup routine at first. With time, the whole process will become easier. The trick with using is learning the right distance from your face for applying the makeup. If you apply it too heavy, you’ll end up with areas of too much color known as hot spots. It’s all a matter of getting the touch right. Remember, it’s a mist that you’re applying. It’ll take you a few times to get it right. Don’t worry though. It’s part of the learning curve for everyone. There is also a learning curve with the makeup. Most kits include a selection of foundation shades. That way, you can blend colors to match your tone for flawless coverage. Once you’ve mastered your technique, you might consider sticking with the same makeup with your airbrush. Different products will produce other results because of their formulations. If you don’t usually wear blush, you might want to consider adding it to your repertoire. Using only makeup may make your skin tone look flat. Besides, it’ll give you a chance to branch out with other products like tanners and bronzers. These products can further enhance your look. You can conceal those freckles or make your tan look more even. Many kits include other products like concealers that you can apply before airbrushing. You’ll also find other items like highlighters or bronzers for completing your look. These extras also come in different shades so that you can match your underlying skin tone. You may find that you’ll pay more attention to these subtleties simply because you can work with them. The basic air brush makeup kit includes an air compressor to deliver the power. It also has an airbrush to apply the makeup. You’ll find kits that vary in the amount of control you have over the air pressure. Most include three or more settings. Others have adjustable controls. If you’re just starting out, the latter might offer a better choice. Unless you’re buying only the compressor, your kit will include a variety of foundation shades. A selection of three to five colors will give you plenty of options for creating a blend that matches your skin. You’ll often find kits that specify a tone type like fair or medium. The benefit with these products is that you’ll have foundations that you’ll likely use. Often, the premium makeup systems will also have extra products to help you get better coverage. They may include things like blush or other bonus colors. Blush is an excellent add-on product. It gives you the chance to work on getting the technique down with everything you need from the start. Other products you may see in kits include a moisturizer or finishing spray. Using an airbrush kit is an excellent way to apply makeup like the pros. You can get natural-looking coverage that covers the flaws you’d assume do without. And if you’re like most women, you’ll never consider going back to liquid foundation again. The best airbrush makeup kit puts you in control of your look. 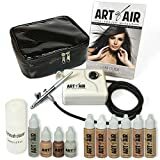 If you’re looking for an impressive Airbrush Makeup Kit – the Art of Air Cosmetic is perfect for newbies or pros. This excellent system is designed to help you polish your image in no time flat. If you’ve never tried airbrushing, you’ll soon realize why the world’s best makeup artists rely on it to get models and celebs ready for their close-ups, or the red carpet!